In this luscious, contemporary family saga, the Angelini Shoe Company, makers of exquisite wedding shoes since 1903, is one of the last family-owned businesses in Greenwich Village. The company is on the verge of financial collapse. It falls to thirty-three-year-old Valentine Roncalli, the talented and determined apprentice to her grandmother, the master artisan Teodora Angelini, to bring the family's old-world craftsmanship into the twenty-first century and save the company from ruin. While juggling a budding romance with dashing chef Roman Falconi, her duty to her family, and a design challenge presented by a prestigious department store, Valentine returns to Italy with her grandmother to learn new techniques and seek one-of-a-kind materials for building a pair of glorious shoes to beat their rivals. There, in Tuscany, Naples, and on the Isle of Capri, a family secret is revealed as Valentine discovers her artistic voice and much more, turning her life and the family business upside down in ways she never expected. 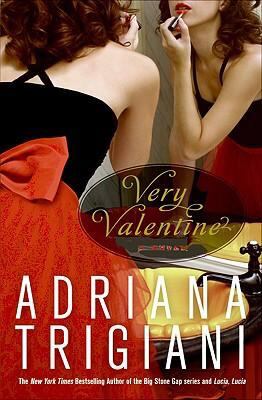 Very Valentine is a sumptuous treat, a journey of dreams fulfilled, a celebration of love and loss filled with Trigiani's trademark heart and humor. I love Adriana Trigiani. Her books are consistently good (I've read seven of her novels so far). I have yet to read one of her novels that I haven't really liked. Unlike Lucia, Lucia and Queen of the Big Time, Very Valentine is set in present day New York. We follow Valentine through a year of her life. Like most of her other work, Valentine is "finding herself." She falls in love, travels to Italy, and has very funny interactions with her family members along the way. Also similar to her other work, there is a lot of emphasis on food in Very Valentine. Reading an Adriana Trigiani book makes me hungry for Italian food! Another thing I really like about Trigiani is her colorful cast of supporting characters. They often supply the humor in her books, and I laughed out loud several times while reading Very Valentine. I love a book that is emotionally moving but also makes me laugh! The plot felt a little slow-moving at times. I love the writing. It is descriptive, clever, and insightful without being too heavy. I know, and you introduced me to Adriana Trigiani, one of my favorite authors now! Thank you! What Meme do you like? "I'd So Rather Be Reading Tee" Winners!